1.Mix confectioners’ sugar, butter or margarine, egg, vanilla, and almond extract. Stir in flour, baking soda, and cream of tartar. Cover and refrigerate for 2 hours. 2.Heat oven to 375 degrees F (190 degrees C). Divide dough into halves. On lightly floured cloth-covered board, roll each half out to 3/16 inch thick. on lightly floured cloth-covered board. Cut into Christmas shapes. 3.Bake on parchment lined baking sheets for 7 to 8 minutes. Let cool on wire racks and decorate as desired. 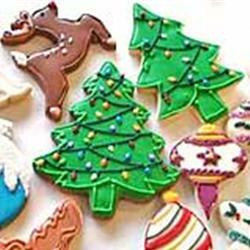 Aug1August 1, 2015 • By Bob • This entry was posted in Holiday Desserts, Holiday Recipes, What's New and tagged cookies. Bookmark the permalink.